Have you ever questioned the authenticity of a viral tweet? Insert a Tweet URL to be verified! You've probably heard about the whole 'Fake-News' epidemic that's been taking over the United States political climate. Turns out that around 15% of Twitter users are said to be automated bot accounts. In the 2016 US election researchers estimated pro-Trump bots generated 4 tweets to every 1 pro-Clinton Tweet! This may make you think - how do you know if popular tweets are actually popular? How can you trust what's going on your favourite social media platform?? Our app is made up of a React.js front end and a node and express.js powered back end! 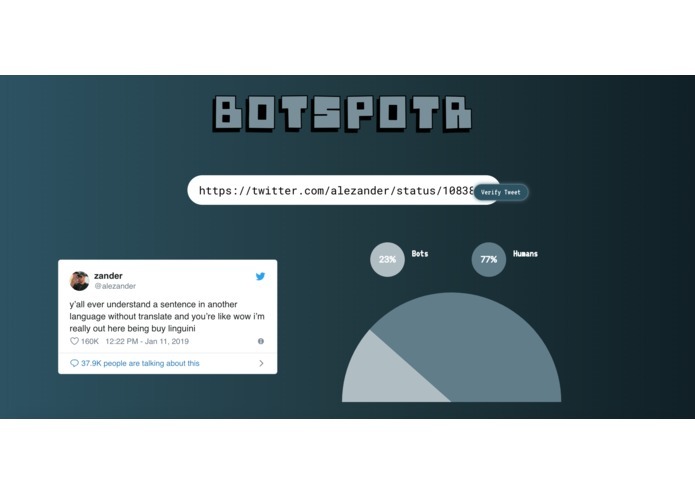 We use the Twitter search and tweet apis along with a special Twitter account validator api called Botometer, which gives us our stats on the tweet.